I listened to your record and it made want to jump out of a window, but in a good way. 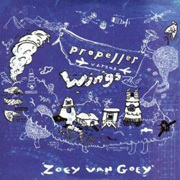 So begins, Sackville Sun, the third track on Propeller Versus Wings, and that is as succinct a summation of the impact of Zoey Van Goey’s anticipated second album as I can imagine. The winsomely colourful storybook cover art of The Cage Was Unlocked All Along is gone, replaced by a study in daydreaming on blueprint blue and collected as a whole the songs have a melancholy heart that is perfectly in keeping with that colour scheme, but this album is not a study in self-pity. Rather, these clever, artful songs are redolent with potential. They explore the tension between the opportunity of open skies and the possibility of failure. They capture moments familiar to all fledglings: poised on the edge, if the can muster the nerve, if they can even work out how, they might be able to fly. Zoey Van Goey may still be a new name to many, but they are learning how to make great albums very quickly. The arrangements on this one are subtler and more textured than the first release, creating zephyr-like currents that hint and nudge and tug the attention in the album’s moodier tracks such as Escape Plans, Little Islands and the transcendent When It Lands. This is not to say that the band have eschewed their talent for insanely catchy pop-tunes. The Cake And Eating It and You Told The Drunks I Knew Karate are two of their best in that department. Nor have they have they lost that uniquely quirky sense of humour, as evidenced by the sugarsweet My Aviator and the stompy, fuzzy pop of Robot Tyrannosaur. But it’s in those introspective songs that this beautiful album’s heart lies. I’m letting go of windows. I’m letting go of fingers and toes, they sing in Extremities. With this album, Zoey Van Goey are more than ready to leave the ledge. These songs simply soar.